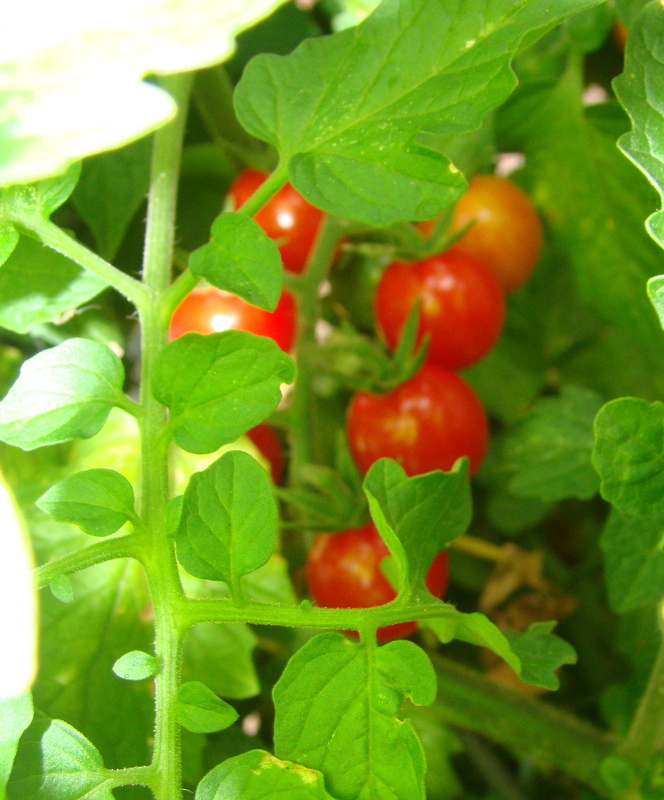 I left the wild cherry, which was the earliest of the tomatoes to mature, outside since it already had provided quite a prolific supply of tiny pearl-like fruit, and thus, I believed, completed its cycle. Well, the wild cherry apparently wasn’t ready to go “gentle into that good night.” Through the cold and absence of watering (at least by this gardener’s hand) it continued to make tomatoes — decorating the brown stems with its bright red bounty. And when its efforts went unheralded and its gifts uncollected the heirloom proceeded to drop the excess onto the flooring. I was so impressed by its resilience that I decided I’d move the other two pampered heirlooms (which had indeed continued to provide an indoor harvest) back out to join the wild cherry. 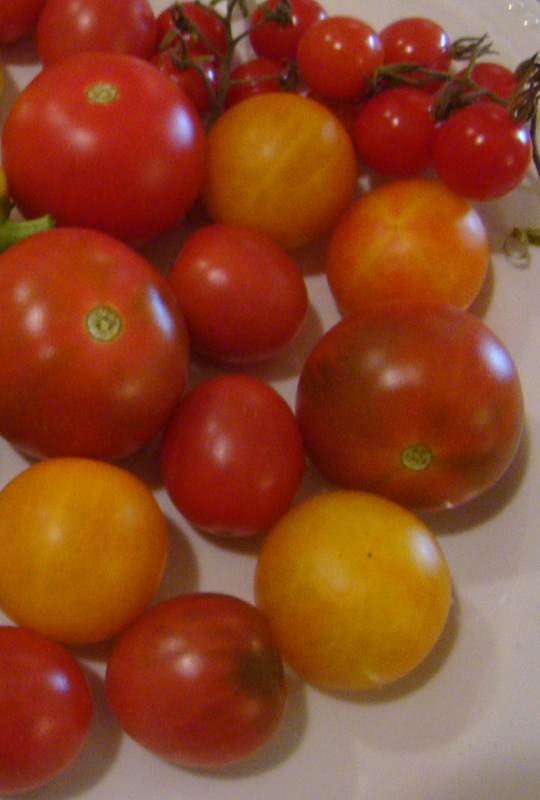 By happenstance, Chicago’s weather took a turn for the better around that time and all three plants gave a final push and produced one more wave of tomatoes. Gardener’s notes: Of the three heirloom tomatoes that were in my garden this summer — wild cherry, Rosalita and Isis candy — my favorite was the Isis candy. It was sweet and delicious with a color range from yellow to golden orange to red. The Rosalita had a mild flavor and the wild cherry had a richer taste. All were pretty prolific, but the wild cherry was the fastest starter. How lovely to get another harvest from your tomatoes, especially after you thought they had given up. Thank you also for the review on the varieties, it’s always helpful to know how they perform. There’s an award for you on my blog, I hope you will accept it. Hi Avis! I only know how to differentiate between tomatoes for cooking, sandwich and cherry type at the market here 😉 I usually get those orangy ones for cooking soup like minestrone. Those really red ones for sandwiches. And cherry type for salad but this is not my usual diet he he… Love your harvest! It’s not difficult saving tomato seeds, just takes a little time. The way I’ve done it is to squeeze tomato seeds and juice into a bowl or cup, and add about 1/2 as much water as tomato juice. Let it stand at room temperature for three days. (this can get a little smelly, so hiding them under the sink or somewhere is a good idea.) Stir twice a day, let rest a few minutes, then skim the scum off the top, and add a little more water. Seeds that float to the top are probably hollow and infertile, so skim them off too. After three days pour the seeds into a strainer and rinse well. Dry thoroughly to prevent sprouting. Spread onto a plate, (paper plates work well, but you can use non-disposable too,) stir once a day to prevent clumping. Store them in a paper envelope when they are dry enough to snap in 1/2. 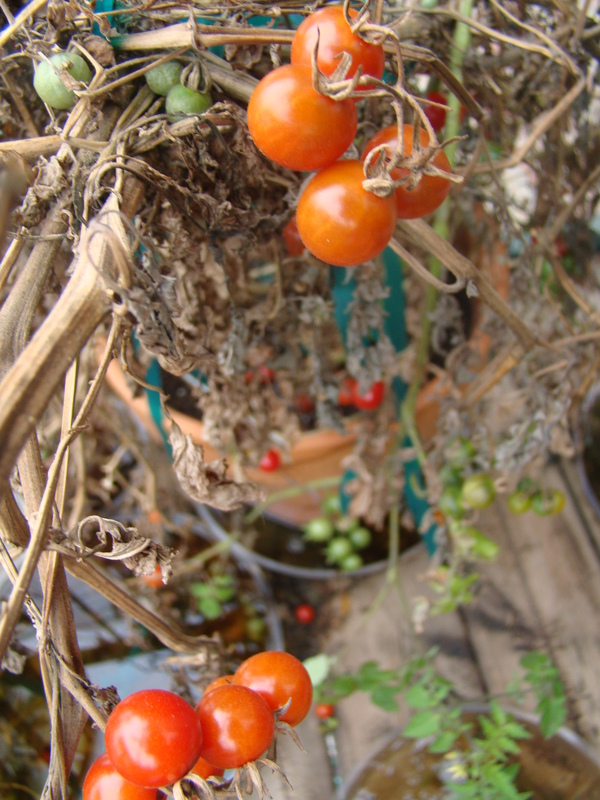 Since they’re small, Drying tomato seeds usually only takes 2-3 days, depending on humidity. It’s really easy to do this, just takes a few minutes or less each day for a few days. Growing your own is so satisfying, and growing them from your own saved seeds is, to me, worth the little bit of effort. From what I’ve read, each generation of saved seeds become even more well-adapted to a gardener’s particular growing environment. Thanks for sharing your method. I hadn’t thought about the seeds producing tomatoes hardy for your specific environment, but that’s a great point. I think I’ll try it your way! Cheers!